Tony Curtis, winner of the special award for World Film Favorite with the presenter, his actress wife Janet Leigh, backstage at the Golden Globes, Wednesday, February 26, 1958, Cocoanut Grove, Ambassador Hotel, Los Angeles. 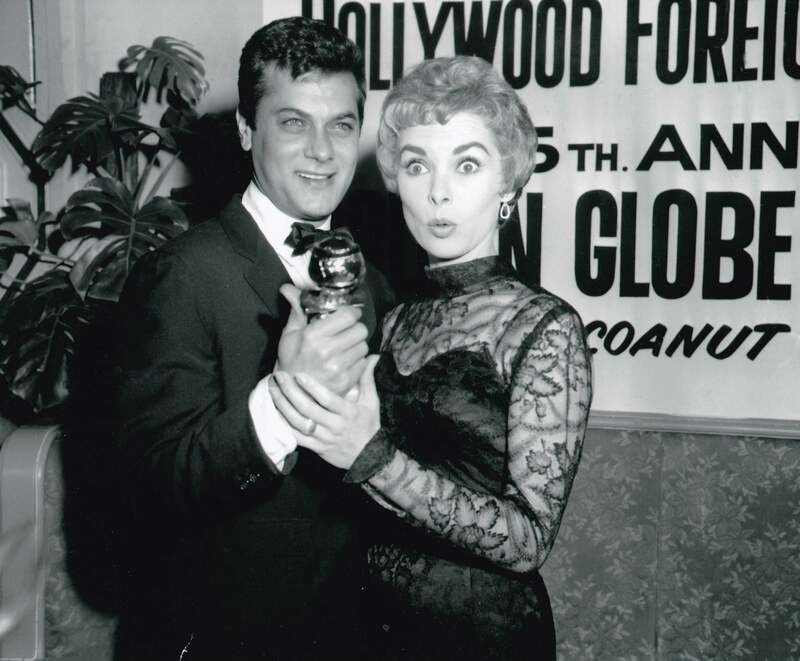 Tony Curtis won World Film Favorite again in 1961 and was nominated for Best Actor in 1959, for the Best Picture-Drama winner The Defiant Ones - his costar Sidney Poitier and director Stanley Kramer were also nominated. Janet Leigh won a Golden Globe as Best Supporting Actress in 1961 for Psycho, directed by Alfred Hitchcock. Tony Curtis and Janet Leigh are the parents of actress and twice Golden Globe winner Jamie Lee Curtis. They were married from 1951 to 1962.